New Delhi Sep 16 (IANS) The United Left alliance of four student groups on Sunday won all four top posts in the Jawaharlal Nehru University Students Union (JNUSU) and declared that it was a victory for those who don t want Hindustan to become a lynchistaan . 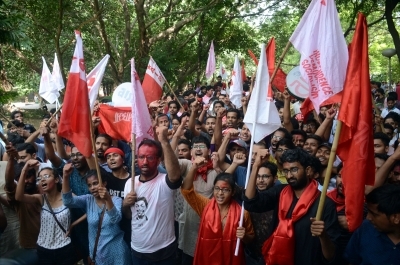 After violence-marred counting process the Left easily overcame the challenge of the RSS-backed Akhil Bharatiya Vidyarthi Parishad (ABVP) leaving it way behind and triggering noisy celebrations in the sprawling campus. The Birsa Ambedkar Phule Students Association (BAPSA) trailed at the third position for the post of President Vice President and General Secretary. The National Students Union of India (NSUI) was the third runner-up for the post of Joint Secretary. The JNUSU Election Committee said the winners were N. Sai Balaji (President) Sarika Chaudhary (Vice President) Aejaz Ahmad Rather (General Secretary) and Amutha Jayadeep (Joint Secretary). The Friday election drew 5 185 voters were cast marking a 68 per sent turnout a steep hike from last year s 58.69 per cent. Of these 5 170 votes were counted as valid. New Vice President Sarika Chaudhary received the most votes -- 2 692. She defeated ABVP s Geeta Sri by 1 679 votes. Balaji secured the highest winning margin for the President s post (1 189 votes) over ABVP s Lalit Pandey (972 votes). Left s Rather and Jayadeep got 2 423 and 2 047 votes respectively defeating ABVP s Ganesh (1 235 votes) and Venkat Chaubey (1 290 votes). As the results became known Left supporters in the traditional Left bastion celebrated with slogans of "Lal Salam" and "Inquilab Zindabad". A victory march was taken out from Sabarmati Hostel. The United Left is an alliance of the All India Students Association (AISA) Students Federation of India (SFI) Democratic Students Front (DSF) and All India Students Federation (AISF). The President-elect belongs to AISA the Vice President is from DSF the General Secretary s post went to SFI and Joint Secretary s post was grabbed by AISF. Balaji called it a "victory for the students and the people of the country who are unitedly fighting this fascist government which is imposing anti-student and anti-people policies... It is a victory for those who don t want Hindustan to become lynchistaan ." Balaji blamed the ABVP for hooliganism in both Delhi University and JNU. "In DUSU election we saw how the ABVP Vice Presidential candidate was involved in a massive fight in Zakir Husain College. And yesterday we saw how the common students were attacked by the ABVP in JNU. "They are trying to run away from issues like fee hike fund cut..."